Most visitors to Santiago get to manage the city quickly and easily. Infrastructure is beyond reproach, services are to high standard and its attractions can be enjoyed with fewer apprehensions than in other South American capitals. In contrast, tourist information facilities in the capital are few and far between and generally mediocre (which underlines the need for websites such as these). This pushes travellers to talk to and seek advice from locals, which is actually a great thing. As a rule, santiaguinos are friendlier towards foreign visitors than to other santiaguinos. 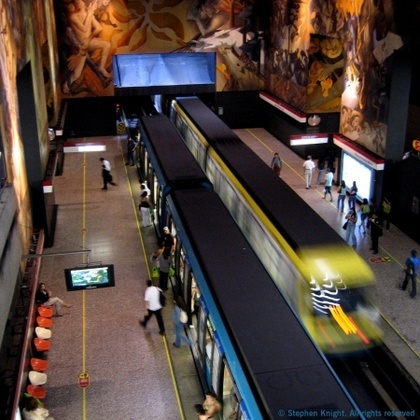 Santiago’s Metro is clean, efficient and easy to use. By-passers will often be knowledgeable and chatty sources of information for directions, places to eat and occasionally, anecdotal facts about where you are standing. Make the most of them. As to practicalities, nothing beats taking matters into your own hands. If you want to make informed decisions, the sections below will give you advice on the most frequent travellers’ questions. Of course, these sections offer ‘guidance’ only and you should expect circumstances and situations to change rapidly. Comments, corrections and criticisms in respect of this section are all very welcome (see About us and our contributors section).